Social media initially seemed like a fun way to keep up with my interns and the students in the classes I was teaching at the local community college. That was back in March 2007, the early days of Facebook being available to the public. 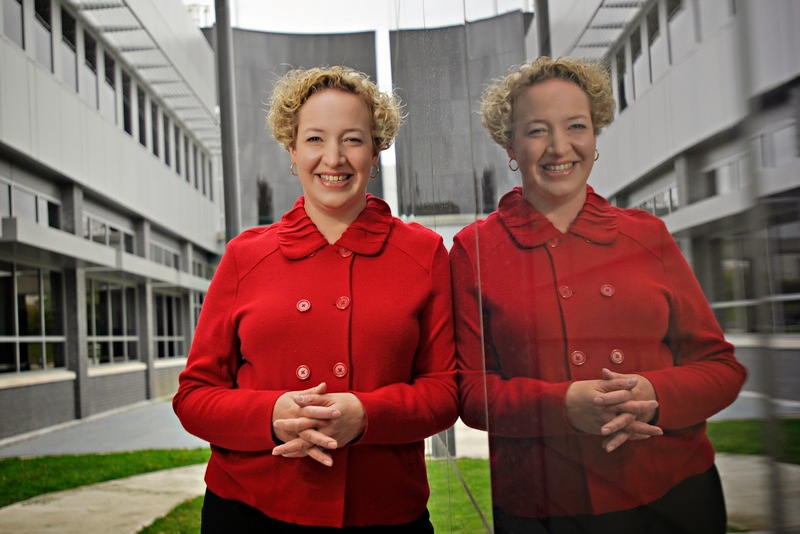 By the time I joined LinkedIn (in February 2008) and Twitter (in March 2009), it was clear that social media was part of my job as a university communicator. Although I launched the Binghamton University Twitter feed, these days I have the luxury of using social media as part of my job without having direct ownership of any of the campus’ official channels. Stay positive whenever possible, whether posting about my life, my employer or something else. No one, not even your closest friends, really wants to listen to you complain. At least not very often. Share work that I’m proud of across as many platforms as possible — and make it easy for others from my campus and my university system (the State University of New York and the Research Foundation for SUNY) to do the same. I don’t maintain a separate research news Twitter feed, for instance; instead, I contribute tweets that go out from the university’s main account. I reach a wider audience this way, and it reinforces the importance of research to the institution as a whole. Give serious thought about whether to join new networks. I have an account with Google Plus that I very rarely use, and that serves as a good reminder to me that I don’t need to join Every. Single. Network. Stay current with the networks I do join, without being a slave to every single post. I give myself about an hour each morning to dip into Twitter and LinkedIn. Facebook and Twitter usually stay open in a tab all day so I can see what’s happening. It has always been part of the job to know what journalists are interested in, and Twitter in particular has made it easier than ever to see that. It’s also part of my job to know how other schools handle research news, and Twitter also enables me to keep up to date with a variety of peer institutions as well as schools whose efforts Binghamton might want to emulate. This is a two-way street! Don’t post something unless you’ve considered how you will (or won’t!) respond to criticism, requests for more details, etc. In my experience, people say they understand this, but then often have a knee-jerk desire to remove negative comments. 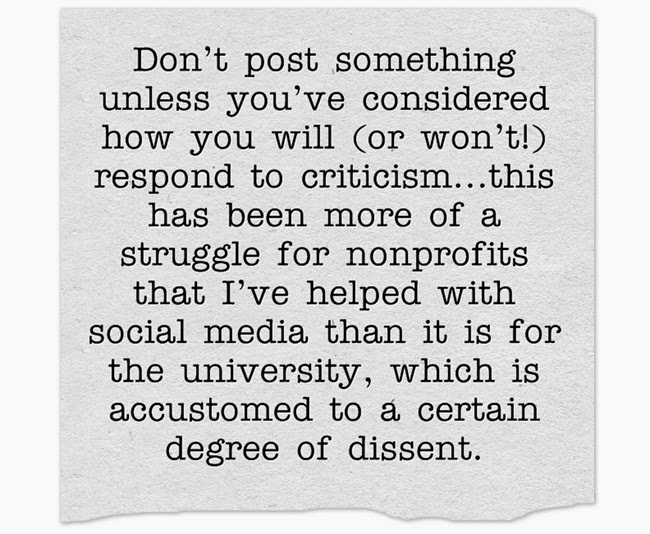 Interestingly, this has been more of a struggle for nonprofits that I’ve helped with social media than it is for the university, which is accustomed to a certain degree of dissent. The other big lesson, one I’ll credit to Sree Sreenivasan, a real social media guru and one of my Columbia professors, is that most people will miss most of what you do on social media. That’s right: Most people will miss most of what you post. Since absorbing that lesson, I’ve been less shy about devoting multiple tweets to one topic. I’m also less shy about telling a friend about something that I’ve posted about on Facebook! In order of the time I spend with them: Facebook, Twitter, Pinterest, LinkedIn, Goodreads, Foursquare, Instagram and YouTube. I check our research news website’s analytics regularly, and pay attention to which social media networks produce the best traffic. It’s humbling to see how much is out of our control. Some months, for example, Reddit (which I don’t use regularly) directs more traffic to our site than all of the other networks combined. I also use Klout to see how different posts perform and to track my own status as an influencer. Build better/easier sharing into everything that we do. Increasingly, people are reading what their friends share, so it’s vital that we make it simple to share the news we produce at Binghamton. I’m also always looking for ways to streamline my efforts. In 2013, I embraced Hootsuite, and that has made a huge difference in my use of Twitter. The Binghamton University research magazine’s digital edition (or at B-Reader in Apple’s App Store) has a simple sharing mechanism built into every page. Click on the suitcase icon when you’re reading a story to share across a variety of platforms. Binghamton University hosted the 2013 conference of the University Research Magazine Association. I put together a Storify for the occasion. It’s a cool way to capture our social media mentions from the event. I plan to do something similar in February as part of my work as the social media director for the (much larger) Council for Advancement and Support of Education District II annual conference in Baltimore. One of my favorite things about Storify is that you can set up a slide show of all the tweets/photos/mentions and use that as part of an interactive display during an event. The time you put into curating the content on your hashtag can pay dividends in multiple ways.